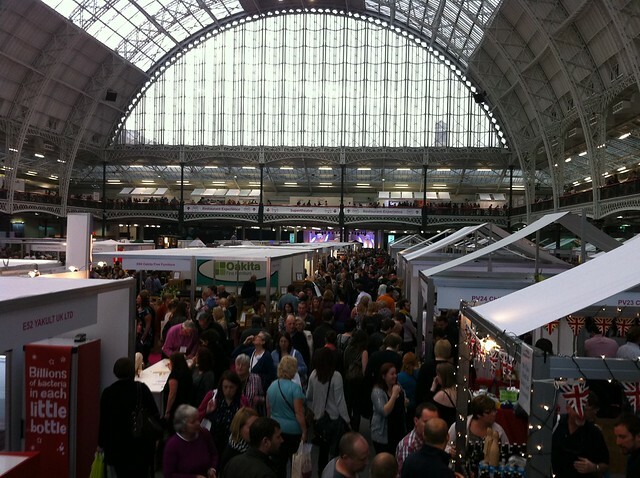 BBC Good Food Show London – back and better than ever! 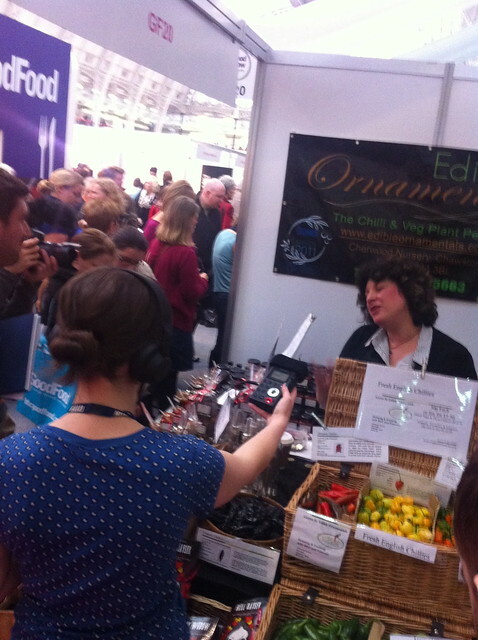 The BBC Good Food Show London was back in the Capital last weekend, and although hard work, was a truly awesome Show! Thanks to all that visited, exhibited and worked to make the show brilliant and better than ever before! In this post I’m giving a few sneaky pre show pictures, a few of my shopping highlights and a run through of the areas that I look after at the shows – where you will find all the lovely, speciality artisan producers! So to begin… the show in choux! 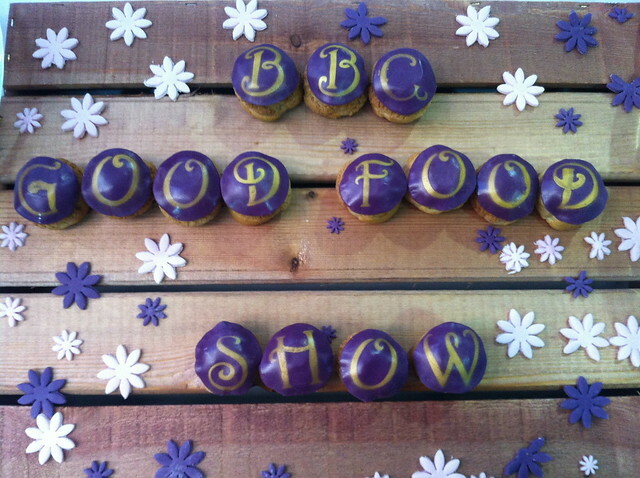 Brand new company Choux London impressed us with this gorgeously edible homage to the BBC Good Food Show, along with their fabulous filled choux buns. My favourites were salted caramel and peanut butter flavours. 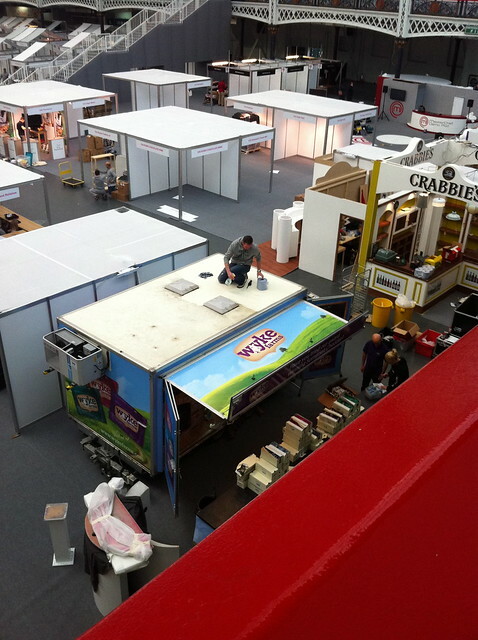 I often wonder if visitors know how much work goes into putting our shows together… not just the year building up to the show (we’re already working on the 2013 show!) but in the days before the show opens. Below are a few sneaky pre show insights which might surprise you! 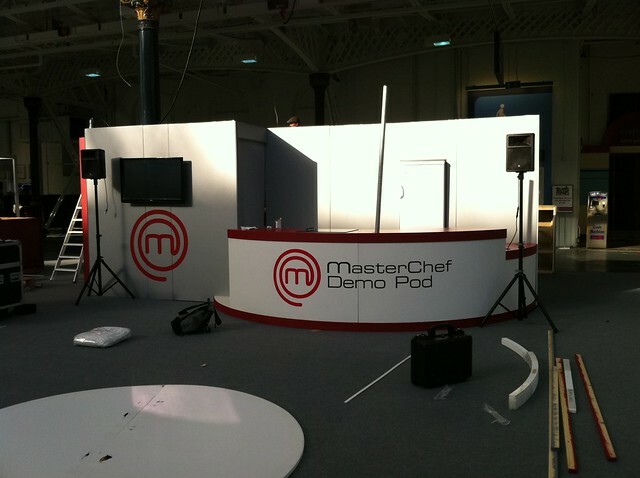 Thursday 1130 – MasterChef Demonstration Pod half way to being built. Thursday 1300 – Getting our (well, show manager Paul Patterson!) hands dirty cleaning a stand roof! 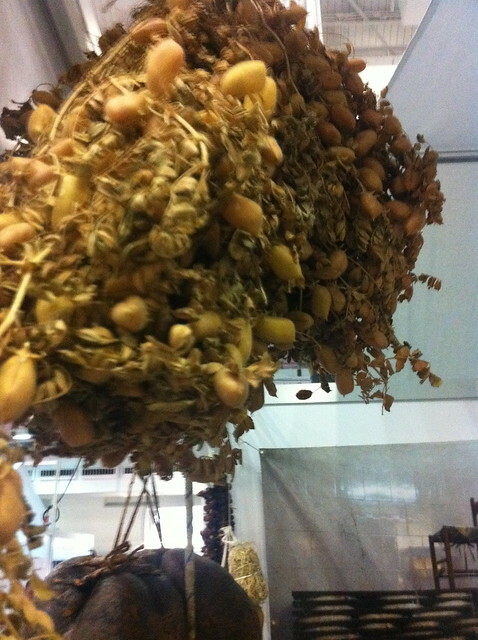 As you can see lots of stands still just empty shells at this stage. 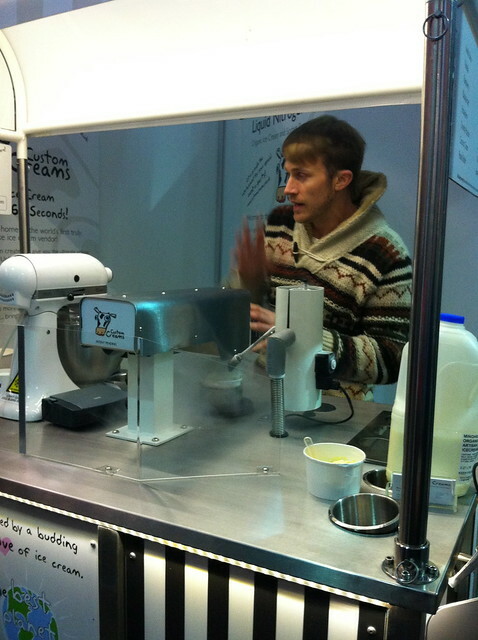 Thursday 1730 – meeting with Custom Creams for a liquid nitrogen powered ice cream making demonstration! I love show opening – we usually have one of our celebrities open the show by cutting ribbon with giant scissors. 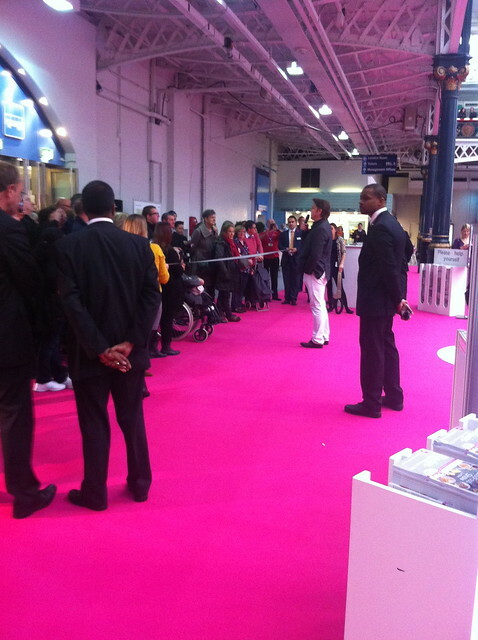 Below is James Martin on the Saturday, don’t his white trousers make our pink carpet look bright?! It’s great to see thousands of food lovers all under one roof, and I must admit, Olympia is definitely my favourite venue in terms of how beautiful the structure is. When the sun goes down there are some amazing colours coming in through that huge domed window! Here is a bit more about the areas of the show that I look after and am very proud of! This is our collection of nearly 100 small artisan producers, which we have scoured the country to find – from charcuterie to choux, truffles to turkey, fish to fudge there should have been something to please most foodies! The smell of aromatic coffee wafts from the Jaccs Gourmet Coffee stand, where you could find all sorts of beans and flavours of coffee. Mortons Turkeys came all the way from North Norfolk (very near my home town!) and were sampling their delicately smoked duck and taking orders for Christmas turkeys at the show – I’m planning to visit the farm when I’m back home for Christmas! I always make sure I buy some Calabrian (Italian region) delicacies from De Calabria before the end of the show. Giuseppe is a real character, “an arteest” as he would put it, and is a wonderful addition to the show – he brings the most deliciously vibrant green olive oils, wild honey and herbs, n’duja, chilli products, sun-dried tomatoes, cheeses, salamis, even chick peas (I bet you didn’t know they grew like this?!)! 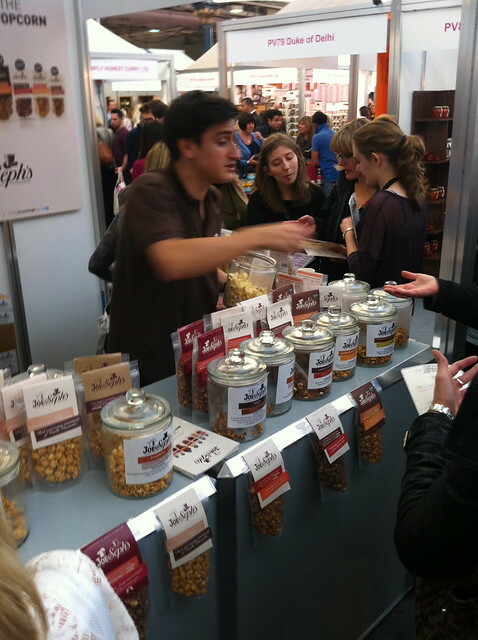 Joe and Sephs launched their gourmet popcorn company at our show 2 years ago and they never cease to amaze me. True to their nick name of the Willy Wonka of the popcorn world, their black pepper, chilli and caramel is magical as you get the caramel first, then a black pepper hit, and then seconds later the chilli starts to build… and then you just want more (and more!). Other flavours include madras curry, brandy butter, goats cheese (not for me but others love it), mince pie and vanilla cheese cake. 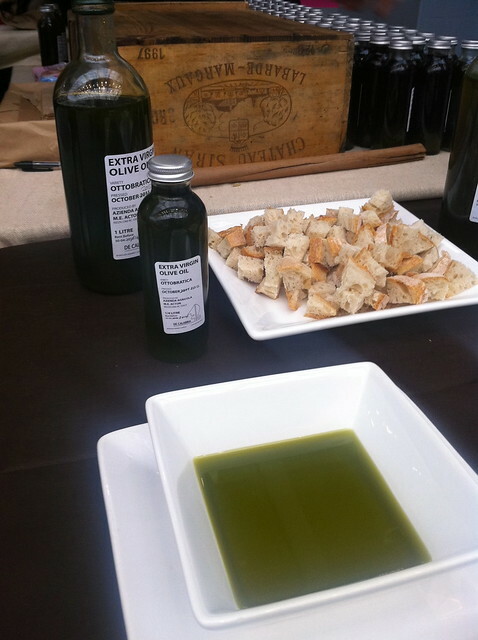 If you haven’t tried before then you must, you won’t regret it! 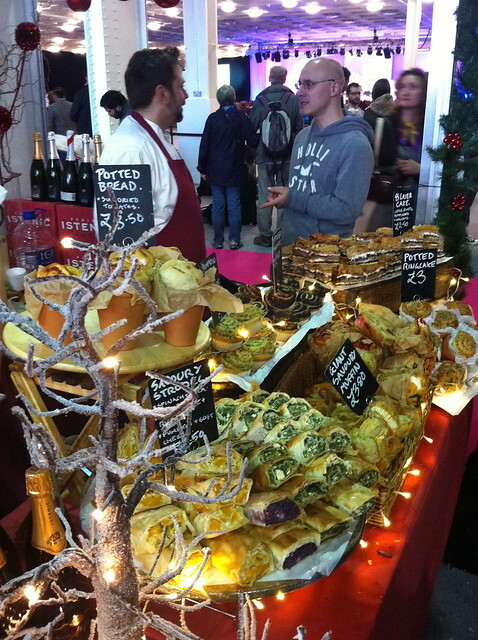 I shouldn’t have favourites, but Karantania Deli had to be one of the most attractive stands at the show – a tree decorated with chocolate salami twinkled away between piles of irresistible pastries, breads and cakes and bottles of bubbly, chocolate liqueur and other Slovenian delights. I love it when producers make an effort with their stands like this! 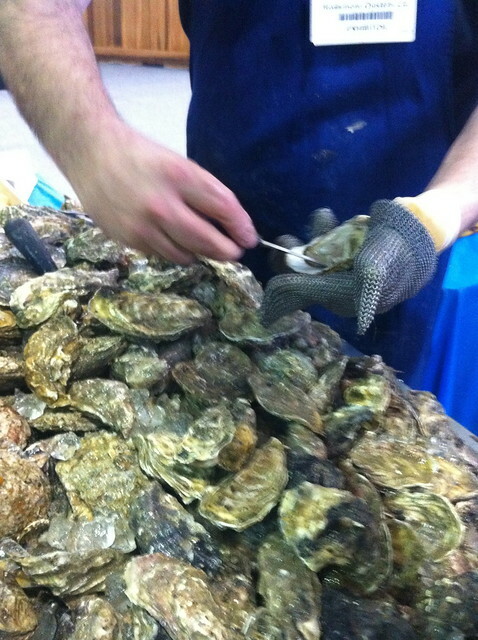 I sometimes come across oyster virgins trying their first at the Shows… love ’em or hate ’em literally thousands get shucked and knocked back at the shows! David here, from Real Organic Foods, created his company through a passion for food and by noticing a gap in the market for organic foods that actually tasted good. Definitely worth a try! 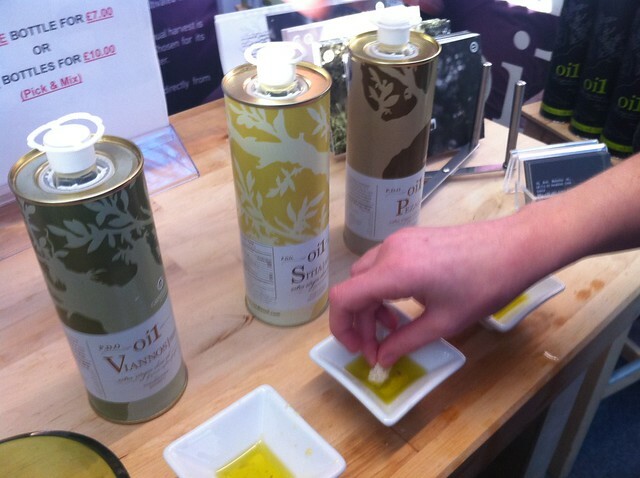 I was sure to take advantage of the bargain olive oil from Candiasoil – beautiful bottles and delicious single estate oils from Crete, the perfect stocking filler for a foodie! 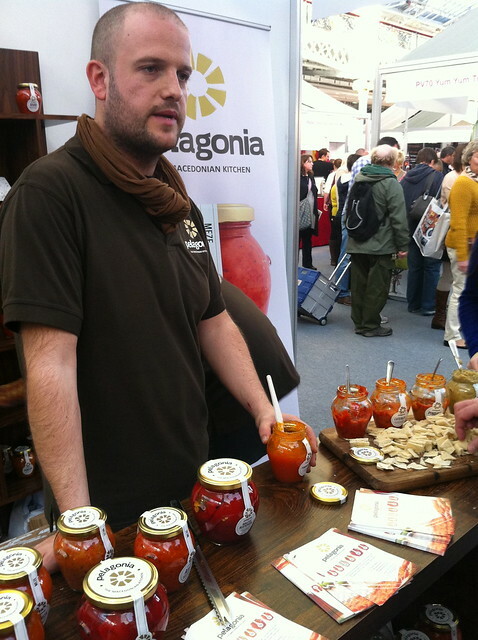 New to the show this year was The Pelagonia Range – Macedonian mezze products like pumpkin jam, roasted peppers and other delicious dips. Our bursary award winners did us proud and every one of them loved using the show as a springboard to put their products in front of thousands of influential food lovers. 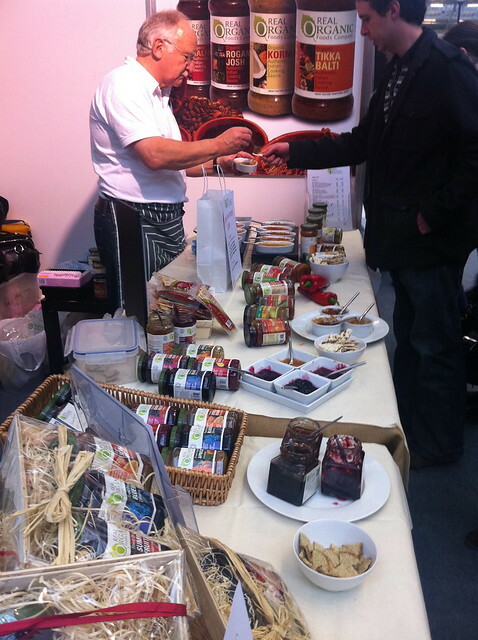 We had amazing African sauces from Bim’s Kitchen, savoury seaweed seasonings from Mara Seaweed, delicious drinks from Norfolk Cordials, seasonal pestos from Well Seasoned, hand made and indulgent marshmallows from Patchett’s Confectionery and authentic Indian fresh chutney from the Maha Partnership. Take a look at how they got to the show here. Now, there are so many other things I could write about here… but I could go on forever! Look out for my highlights of the BBC Good Food Show Winter, which opens at the NEC next week on the 28th November, or perhaps I will see you there? !